Hello everyone! I can’t believe 2 weeks have passed since my last ScrapMuch? reveal, but here we are again. Team A is back this week with yet another fabulous reveal (if I do say so myself!)! 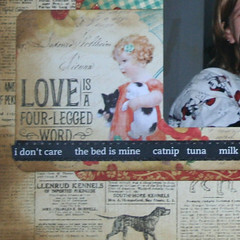 I played with some of the brand stinkin’ new Graphic 45 Raining Cats and Dogs that I got from the amazing ScrapMuch?! 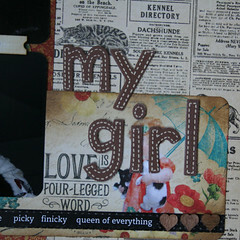 I’ve had a long running love affair with Graphic 45 and I am absolutely thrilled they came out with a pet themed line. This line did not disappoint at all! It’s classic Graphic 45, not excessively cutesy, and has a ton of generic papers too! 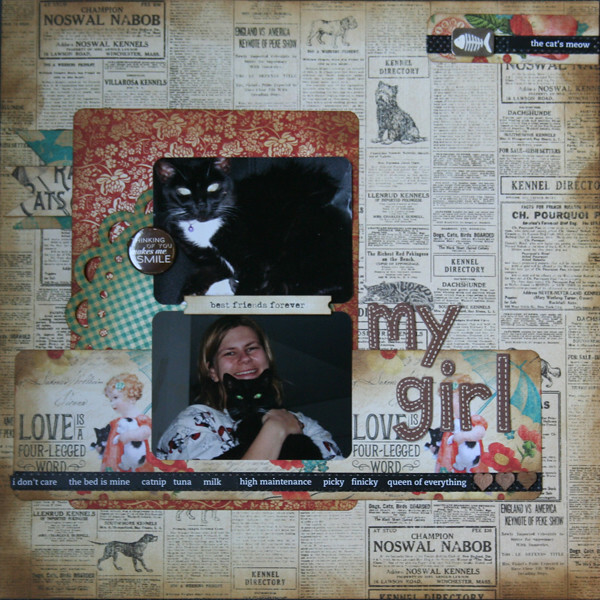 My sweet kitty, Socks, is the focus of this layout. 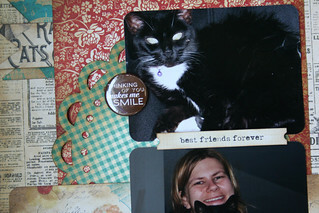 I’m trying to scrapbook her more because I know it will be really difficult when she is gone. What can I say, she’s an awesome cat, and I’m very biased. How about some detail shots since I took them this week? So now it is your turn! I’d love for you to pop over to the ScrapMuch? blog and see what the rest of the team created (Hint: I’m the only one who didn’t scrap a Hallowe’en themed layout because I don’t have kids and it’s been eons since I’ve gone to a Hallowe’en party)! We would love for you to join us in any one of our weekly sketch challenges or our monthly colour challenge! Here is a run down of our Sketch-y Friday rules. Just link up your creations in our sidebar to be entered into a random draw for our monthly prize. You have until October 29th, at midnight to participate in any of October’s sketch challenges, each linkup tool will remain open until that date! I can’t wait to see what you create! This is just wonderful Tiiu! 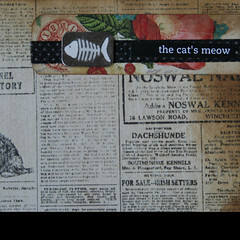 The papers are “Purrfect for your layout! I love the vintage look! Fun layout! I spy a fish at the top right corner right away and smiled! Perfect pp for pets! Great take on the sketch! Love you fun take on the sketch, and that you stand out in the crowd! Love those paper Tiiu, gorgeous page! I absolutely love this layout! It has motivated me to scrap my new cat Maggie Muggins. Thanks so much! I too love Graphic 45!